On Tuesdays, baby Pords and I get special mummy/daughter bonding time at baby music class. It’s quite late in the afternoon and by the end she is usually starting to get quite tired. Today, was no exception. She was so enthusiastic at the beginning of class. Laughing and “singing” and exploring all of the wonderful instruments. She was interacting with the other babies and having fun. She particularly loved the dance portion of proceedings – always a special favourite. Then she started getting a bit over it. We were both looking at the clock. But then, just before the end of class, our music teacher pulled out some bubbles. Pords’ mood immediately changed. She was absolutely delighted as she watched them float around. She chased after them, tried to catch them, and just sat and watched. She watched me blow more and more. She looked at me, then at the bubbles, then back at me. What is this delightful witchcraft? Bubbles are magic like that. I hope that as she grows and her days become less filled with bubbles, she is able to recall that feeling of contentment that just sitting and staring at bubbles now brings her. When bubbles fill the skies. When bubbles are at play. The bubbles’ spell is broken. That lives on inside you. They can only stay awhile. They’ll sparkle through your smile. Delightful! Maybe we should all have bubble therapy occasionally. Gorgeous! I love your poem, captures the essence of bubbles perfectly! I love how babies and young children can be so mesmerized with bubbles. One of my favourite activities to do with them. Thank you. Yes, bubbles are one of our favourite activities too. I agree with Annes comment some bubble therapy for all of us sounds good! A perfect happy post for #happydiaries, loved it! mackenzie glanville recently posted…Come Home. The Speed Bump recently posted…So You Think You Can Mom? Im 42 and I still absolutely love playing with bubbles. There use to be many years ago a clock in a shopping centre in Cheltenham. It had a fish suspended from it, and when the clock chimed it spun round and blew bubbles. I loved that clock!! Lucy at occupation:(m)other recently posted…What’s In Your Pockets? Aaah, lovely poem!! My 2 just love bubbles too! We go a similar sounding music class, where there is always bubbles at the end, and I never tire of seeing their little faces every time the bubbles come out! We’ve also got a automatic bubble machine at home, I can’t use it indoors because it makes the floors dangerously slippery, but it was a great entertainer outside in the summer! That’s so true. I’ve mastered making my own bubble mixture now and they would happily play in bubbles all day. I really need to try and remember that in the lead up to Christmas! What a lovely poem. It brought back some lovely memories f blowing bubbles with my son. 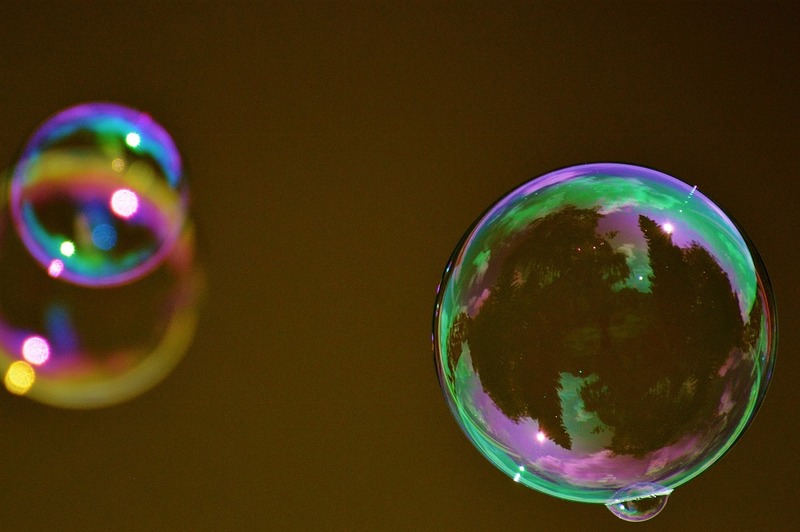 I’m in agreement about bubble therapy – much needed to soothe the soul. They’re just enchanting aren’t they? Very soothing indeed. Susie Glasgowdragonfly recently posted…The Best Days? Troubles do seem to float away with bubbles! Shame they come back!